We are featured on Pooja Makhijani's beautiful blog, Notabilia, here with a gorgeous Huat Kueh recipe. This home recipe is from my collague, Kia Meau, and was originally written for a family charity cookbook. 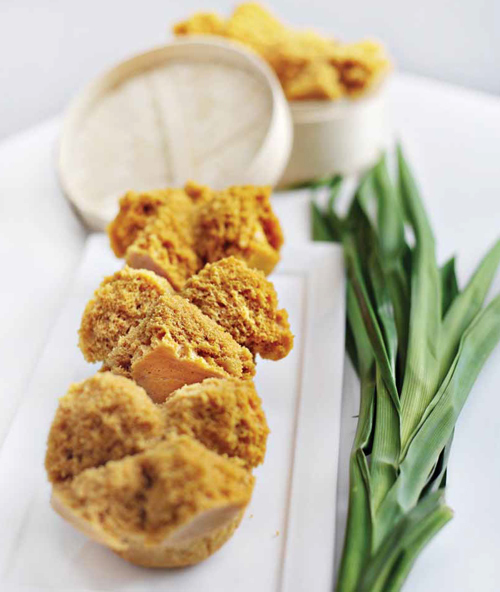 In Kia Meau's own words "the steaming process for the Huat Kueh creates a “bloom” that symbolises prosperity. Hence, Huat Kueh (also known as prosperity cake), is commonly used for offerings during ceremonies and Chinese New Year. My family will usually prepare the Huat Kueh during the Hungry Ghost Festival. Each time when we make the kueh, we always have an anticipatory “you-never-know-what-you’re-gonna-get” moment as we were not allowed to peek inside until the time is up." I, on the other hand, had never eaten Huat Kueh before last year, having always associated them with Chinese religiousity and prayer, as they were often dotted with red dye on the top surface. When I was young, I balked at the bright colours and I felt they were often dry (especially if left out in the sun or on an altar) or too sticky. The beautifully perfumed steam from the steamer drew me to try Kia Meau's kueh and I loved it, from the natural colour to the deep aromatic fragrance, which just goes to show that you learn a new thing about food everyday. These kueh are made of gula melaka and coconut milk which makes them more healthy than the refined-sugared version, the taste is thus more mild while being more deeply flavoured and the texture slightly more sticky. This recipe fascinated me because I’d never seen one that told you to put the pandan leaves in the steaming water, thus perfuming the steam that goes up through the kueh. I hope you'll like it as much as I do. 1. Prepare a steamer. Tie 4-5 stalks of pandan leaves into a knot and boil together with water in the steamer. 2. Prepare the sugar mixture. Tie 4-5 stalks of pandan leaves into a knot. Add to chopped coconut sugar and 300 ml of water and bring to a boil until the sugar mixture becomes 550 ml. 3. Strain the pandan leaves and impurities out of the sugar mixture. 4. Stir the butter into the sugar mixture until it melts completely. Set aside to cool. 5. Sift the self-raising ﬂour with bicarbonate of soda. Using an electic mixer, slowing mix in the sifted ﬂour and bicarbonate of soda, egg, and coconut milk to the cooled sugar mixture. 6. Pour the huat kueh mixture into greased mufﬁn trays and ﬁll them to the brim. 7. Steam for 15 minutes. A longer time will be required for steaming larger huat kuehs. Do not open the steamer before the stipulated time. 8. Remove the mufﬁn tray from the steamer and leave to cool for at least 10 minutes. Do not remove the huat kuehs from the mufﬁn tray within that time as they need to be cooled in the trays to set. 9. Remove the huat kuehs from the mufﬁn tray and place them on cooling rack to cool completely. Makes 8 mufﬁn-sized huat kuehs. beautiful macarons, olive oil macarons, chocolate macarons and jasmine tea macarons, waiting for a delivery. I wanted to show you a recent macaron adventure that was a little less than perfect. Brewing a thick mix of tea and emulsifying it into milk chocolate. A misstep with the shells that looked so perfect and this is what we wound up with. Disaster, the shells were perfectly formed on the surface and then completely melted within. We re-made the macaron shells and these are the French Lavender Earl Grey Tea macarons. To regain our macaron mojo, we also made some pistachio macaron prettiness.